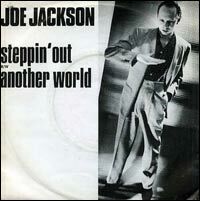 I recently had a request for a Joe Jackson song on the blog, so here it is. I’m actually surprised this is the first time I’ve featured Jackson. I like his music a lot, own several of his albums and consider him a uniquely talented artist. In fact, he’s not just worthy of a SOTD, he’s worthy of his own theme week. I’m guessing the reason I’ve avoided Jackson is that for all his talent he tends to leave me a little bit cold. There’s a studied quality to his music that I don’t find all that inviting. I can see the same criticism of Elvis Costello, one of my favorite artists, and I do see some similarities between the two men. But the best of Costello contains a warmth that melts away some of the cerebral posturing. I could have gone in a lot of directions when picking a Joe Jackson SOTD — my two favorite albums of his are his debut, the fantastically frenzied and biting Look Sharp!, and 1991’s baroque pop collection Laughter & Lust. And a number of songs from the albums in between have made an impression on me. But I’m making what might seem like the obvious choice, Jackson’s biggest U.S. hit, ‘Steppin’ Out.’ I’ve always adored this song… it’s one of those ubiquitous hits that somehow never gets old. I remember when a local radio station was changing its format sometime in the late 90s or early 00s. They played David Bowie’s ‘Changes’ and a couple of other “change” songs on a loop for 24 hours building up to the relaunch. Then, at the moment of truth, they announced that they were now a modern rock station and they kicked things off by playing ‘Steppin’ Out.’ I think it was all downhill from there. On a side note, it’s interesting how much of Jackson’s music can be read as having a gay theme. I don’t know if he’s ever confirmed that ‘Steppin’ Out’ is at least partly about coming out of the closet, but that seems to be a common interpretation. This entry was posted in song of the day and tagged Joe Jackson, Night and Day, Steppin' Out. It’s funny that your criticism of Jackson is that you find his music cold. I’ve always found his music almost overwhelmingly emotional. Not that he manipulates emotions. Rather, his lyrics and song delivery feel infused with passion, and I always feels as though he’s completely invested in whatever he is singing. So… when he sings a song that gets to me, it REALLY gets to me. This song does what so many of his best songs do – it offers the listener the chance to interpret it in whatever way he desires. “Steppin out into the light” could certainly be a metaphor for a gay couple able to be themselves without concern about “darkness” or “angry words,” but that darkness is in their lives and the angry words said by them, so it’s possible to interpret the song as a person who wants to step out of that period in his life and into a new, brighter one. I can see to some extent the criticism that Jackson’s music is a bit more “cold” and calculated. Yet, as Amy said, there are a number of songs that display a great deal of passion and emotion, lyrically if not musically. Anyway, bring on the theme week! I absolutely love, love this song. Always liked the video too. The maid dancing with the dress, falling on the bed. Great stuff.